-have you checked the actual level data? Maybe you've made the level empty by accident or something? that any issue, there was no other issue. and nothing for the levels and they are untouched as the level archive file(s) are untouched. However i got it fixed. even though the entry text below are for: Hillville - and there was no issue there. Had some luck, with keen dreams a week ago or so. and, i have been working tweaking the frames, that i made a while ago. "The first line of LIST.TXT must contain the graphic name!" szemi wrote: Nice picture, Zilem. 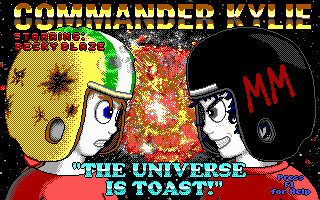 Keening_Product wrote: "Commander Kylie, coming Christmas 2016"
Curious. If issues keep plaguing you I can zip up a Keen Dreams with everything set up and you can compare to see. Levellass wrote: Curious. If issues keep plaguing you I can zip up a Keen Dreams with everything set up and you can compare to see. I got it working, with some help from szemi. Turned out the issue i had, pretty much was down to the Keengraph creating list.txt with it lists incorrectly ordered: "F" "A" "B" "C" "D" "E"
rather then: "A" "B" "C" "D" "E" "F"
I just didn't understand what it was trying to say: "The first line of LIST.TXT must contain the graphic name"
Blargh, I wonder if that's an old or current version? I changed a few things around and I'm not sure what got uploaded. Levellass wrote: Blargh, I wonder if that's an old or current version? I changed a few things around and I'm not sure what got uploaded. Well I'm glad the bug was fixed, but this bodes poorly for it. It may noy be Keen stuff, but alas. Happy Keen-day! Happy Keen Day everyone May the next year of modding be as fruitful as this one. Levellass wrote: Well I'm glad the bug was fixed, but this bodes poorly for it. Although it only happens picture; Titlescreen and Portraits, but not sprites. However when opened in MS paint and just saved, then Imported it with keengraphs. and it will look exactly in-game as it do in the import folder, unlike before. The reason being is that I use a photoshop and not MS paint. it's like somehow the photoshop add something to the file that keengraphs have an allergic reaction to. i started with MS Paint, but that did not work well with multi-layer or multi-part textures. and multiple file-windows and layers is something that feels like missing an arm to be without. but i know how it is being an arm short for 4 weeks. as i broke my right hand a few years ago, and it had to be encased in hard plaster. TL;DR: Photoshop made nonsense, fixed by re-saving the image in MS Paint, before importing with Keengraph, with no oddness found in-game. Adobe is adding a whole lot of metadata junk to your graphics. this might cause these inconvenience you were talking about. Nisaba wrote: Adobe is adding a whole lot of metadata junk to your graphics. this might cause these inconvenience you were talking about. There seem to be an 6 byte size increase though, that MS Paint just scrape off, hmmm. If you send me the modified bitmap (and original) that's causing issues I can look at debugging. even though i have been tinkering with things now and then. one of them being "Kylie" is 5 letters compared to a "Keen" which is 4, which have proven problematic before. But these are some of the tweaks i have been tinkering with for Szemigi's Keen 10 Mod in additional to Kylie. to have them look less like they are wearing the Swat kat flight suit. and more alike the space suit in "invasion of the Vorticons"
Still have the rest of the frames to do, but what do you think?